Back in April, Mashable carried an article about driverless vehicles that is expected to ply Singapore's roads as early as year-end. Chances are if you spend your Christmas holiday in Singapore later, you could be hopping on these battery powered pods. 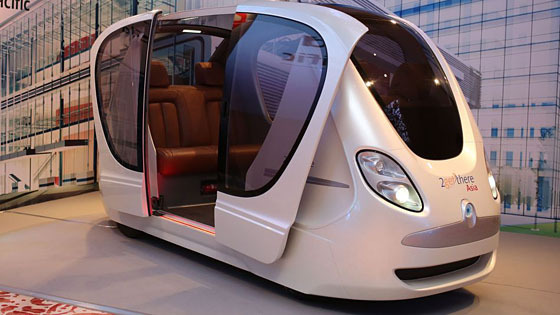 In 2010, Dutch company, 2getthere, specialising in developing sustainable Automated Transit Networks for personal and group transportation, together with SMRT produced 10 similar vehicles for Abu Dhabi's cleantech business park, Masdar City. It is understood that 2getthere also built similar system for Rotterdam's Rivium Business Park, supplying 6 electric vehicles for the park with the capacity of 20 passengers per car. For the Singapore case, these pods - 24 of them that can handle up to 8,000 passengers per hour - are said to be suitable for gated communities, schools, universities and other smaller roads. The concept vehicle for Singapore will run on batteries. The car that's currently running on Masdar City's roads - built by 2getthere. Image: 2getthere. You have got to like this cool, quiet pod for your community! TheGreenMechanics: This may be suitable for UMS. The campus occupies large area of gated community with increasing number of students. In fact, this is one of the biggest campus in Malaysia in terms of land area.